Lately there seems to be an explosion of jewellery designers. I am always amazed at the range of creativity and how they each manage to find a way to stand out as unique. November held a few fashion events, produced by Vernard Goud of LuvNGrace, where several of these talented artists had displays for guest to peruse and shop. One that stood out from the crowd for her luxurious pearl necklaces was The House of BUN by Carola Alder. She had only put the final touches to her first line - christened The Tutu Collection - a few months earlier and followed shortly there after with the creation of her own signature parfum - Lady Godiva. In early December, Alder held her official launch (also produced by LuvNGrace) at Club 560 lounge. Well-heeled guests, some adorned with their own House of BUN creations, were able to turn their focus exclusively to this elegant line. The evening closed with an intimate fashion show, emceed by Meena Mann, which filled us in on the thought behind each of the pieces presented. Adler had an idyllic childhood growing up on a farm in Alberta and busy was her middle name. She trained in ballet starting at the young age of two and went on to compete on horseback, train in synchronized swimming and diving and perform in musicals. By age 12 she was accepted into the Royal Winnipeg Ballet and at age 13 was modeling. She opened her very first business, a summer juice stand call "Juice on the Goose," at the tender age of 14. Business became a family affair in 2005 when her mother joined her to launch Paint the Town Red Productions and co-host their hit TV show, "Mother and Daughter Paint the Town Red." She is also a professional esthetician and massage therapist and explored the world of eCommerce as a distributor for NoTime Skin Care. It was her mother and grandmother who exposed Alder to the world of fashion. Both had been trained by French coutiers and passed on their passion for beautiful things. It was her desire to launch a clothing line that provided the original spark to launch the House of BUN. She remembers, "The making of jewellery came to me after sewing multiple pearls on flower-like chiffon gowns. I decided to create a single strand of pearls. Elegance hit me in a way nothing else had before, I was so inspired. After that I can't say what happened. I got obsessively lost in a dream world, my BUN world." The decision was made to work with exquisite glass pearls, semi-precious gems and Austrian Swarovski Crystals. 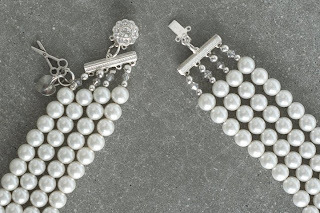 Hours were spent in research to make sure the pearls were of the highest quality. Inspiration for the Tutu Collection came first and foremost from Gabrielle "Coco" Chanel - simple, sophisticated, elegant and timeless. The impetus for individual pieces usually starts with a dream. "Often times I'll wake-up in the middle of the night to scribble down some new idea. I spend a great deal of time perfecting the concept on paper, choosing what colours of Swarovski crystals, how many strands, how long, etc. 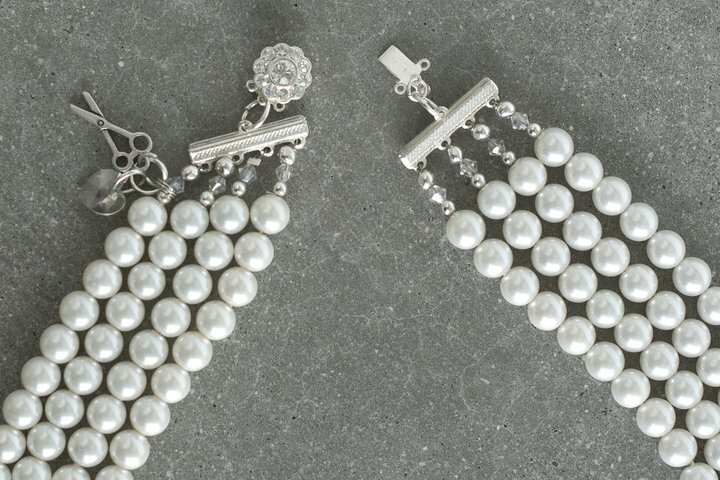 I then move on to working with the pearls in order to create a perfect setting. This can often mean re-stringing the pearls over a dozen time." 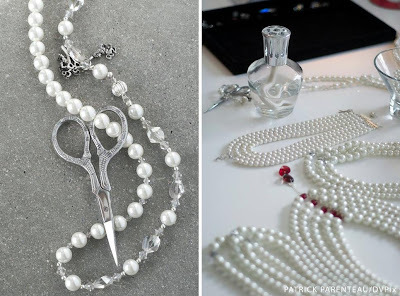 One particular necklace that stood apart from the rest was created in honour of Coco Chanel and has a pair of decorative silver scissors as a focal point. Every design is given it's own name - Berlioz, Madame Darling, Mademoiselle BUN, etc. - and the BUN blessing. Necklines are diverse to make sure there is a look to compliment every ensemble and the number of strands vary from necklace to necklace. Some looks are simple with only a few strands, others make a stronger statement with multiple strands and some have pearls in graduated sizes to show off collar bones. All have crystal details that catch the light. Clasps are a part of the overall design and sparkle with a life of their own allowing the wearer to rotate the necklace to show off this unique detail. They are elegant, luxurious and remind me of 40's - 50's Hollywood glamour. To wear one of these pearl necklaces is to make a statement. You couldn't have one on and walk into a room without garnering attention. Best of all, the price point makes them affordable. Always one to explore new directions, Alder spent many months creating her own signature parfume - Lady Godiva. Originally she felt she would just take all her favourite scents and mix them to come up with a finished product. It turned out to be so much more complicated. A perfume starts with a base note and then the scent is built slowly trying different combinations of middle and top notes. While working to create that perfect scent Alder "...began formulating varieties of all kinds. Most days I could no longer smell as the sents of so many essential oils would begin to get in my head. After having a lab set up in my kitchen for two months, I finally created an award winning parfum! Immediately after taking in a wee sniff, I knew this was it!" What is next on the horizon for this talented designer? She will be taking the House of BUN to the global community. With her experience in marketing and her well-honed business sense, I am sure we will see her explode onto the international scene in the near future. For more information on this line you can visit the Facebook group page at www.facebook.com/iambun or email Carola Alder at bun@houseofbun.com.